A high-quality rendering of the Scratch Cat. A comparison of the Scratch 1.4 bitmap and 2.0 vector Scratch Cat. 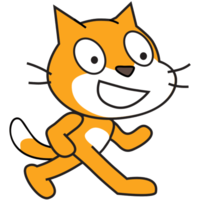 The Scratch Cat is the mascot of Scratch and the default sprite when opening a new Scratch project, though this can be changed. It is also the outline for the default icon of new Scratch accounts, replacing a previous version that showed a human silhouette. The Scratch Cat is a trademark of MIT and was drawn by Wing Ngan. According to Scratch Team member Ceebee, the Scratch Cat is nonbinary, meaning that they do not identify as strictly male or female in terms of gender. Scratch Cat's cameo appearance in a children's book called Hello Ruby: Adventures in Coding, taken from the Scratch Video Update #10. Scratch Cat's flying sprite that was made for the "Make it Fly" collaboration event. Over 35,000 projects use the Scratch Cat in its most well-known form (the costume named 'cat1-a'), making it the second most used image in Scratch from Scratch 1.3 upwards. The high usage of the image is most probably because it is the default starter spirite when creating a new project, or the fact that the Scratch Cat serves as the symbol of Scratch. The image is often used as a narrator for a project (particularly tutorial projects), as it is such a well-known image. It is also frequently used as an interviewee in talk-show-style projects. As well as these, it also serves many other uses. Scratch Cat also serves as an individual species and can be remade. Some remakes have recolored the cat and added some unique details while others are basically characters as the "Scratch Cat". Scratch Cat has been remade into "original characters" and characters from the media, similar to Kirby. When a user attempts to view a project that has been disabled by the Scratch Team, the user will see an animation of the Scratch Cat explaining that the project is not suitable for all members of the Scratch Community and has thus been removed. However, this has been replaced with a simple "This project has been removed" page, with no animation at all. The animation of the Scratch cat can be downloaded here. In a comment, if a user types _meow_, it will turn into a Scratch Cat head. This image became popular in September 2011. Since being discovered, it has been spammed a lot on people's projects. Some Scratchers use them for awarding someone if they did a great job or worked really hard but some just write "_meow_" over and over again. This can make it hard to read comments along with other things. This bothers some people, and is frowned upon. The gray Scratch Cat that appears. Originally, when a page that did not exist was attempted to be accessed on the Scratch Website, a gray picture of the Scratch Cat appeared, and the screen displayed "404. Oh noes! Our server is 'Scratch'ing its head". This has since been replaced by an image of Giga. This image is still used in the 403 Error when a Scratcher tried to access a restricted page. The modified image with the gray Scratch Cat smiling is used on the error page when a user tries to access an unshared project or a project they already reported. The Neigh Pony, one of the April Fools' 2012 Mascots on Scratch. On April Fools' Day 2012, the Scratch Team spread the rumor that Scratch 2.0 would be renamed to Neigh and the Scratch Cat would be replaced by the Neigh Pony. The Neigh Pony bears several resemblances to Scratch Cat, including the presence of whiskers and the white and orange Scratch colors.